The village is located in Chau Phong Commune, Tan Chau District which can be reached from HCMC by heading to Chau Doc Town in the Mekong Delta province, then take a cruise to Chau Giang Ferry, turn left and go straight for about 300 meters to reach Phum Soai Village. 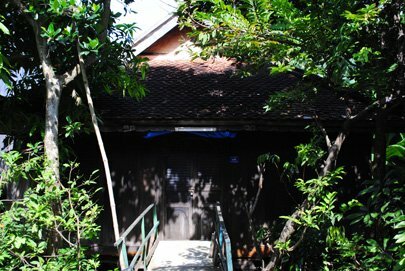 Ho Sa Ich, the head of the traditional craft village of Phum Soai, said that the village has 28 Cham old houses which are over 100 years old. The owner of the oldest house is named only Ali who is the richest villager. The house’s roof is designed in the shape of banh it (three-cornered glutinous rice cake) and covered by tile like fish scales. A large wooden pillar is set up right in the center of the house and the wall has three layers of mortar outside, bamboo in the middle and a wooden inside layer. The whole floor is covered in wood so it is very cool in summer and warm in winter. The house was handmade and decorations and carvings on the wooden walls and pillars were made by talented Cham artisans meticulously. Ich said that all 28 houses will be dedicated to serve as home-stays for tourists to An Giang Province. Staying at houses, tourists will be entertained with traditional musical instruments show and music and dance performances by four artists in the village. Moreover, tourists will have a chance to enjoy traditional Cham food and culture.